Q. Why build with logs and timbers? A. 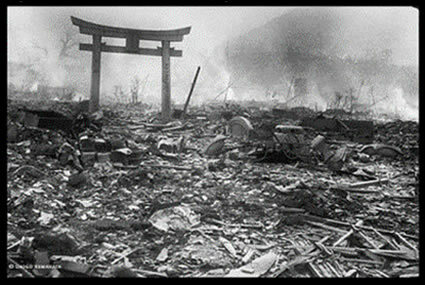 This historic Tori gate survived two holocausts, a graphic example of the strength and flexiblity and beauty of big wood. Building with logs and timbers is the only method which allows one to build and store a structure before having the land. Building with big wood using ones sweat equity, maximizes value and equity. It is part of our history. Q. Is building with big wood environmentally responsible? A. Yes. Log and timber buildings can be recycled and have a lifespan of centuries. All other building methods cannot be recycled and end up as rubbish in a landfill. Q. What is the difference between timber Post & Beam and Bents? A. P&B is a platform system of construction. Bents are transitional frames. For an in depth definition refer ISBA Courses and the Master’s Guide to Timber Framing by James Mitchell. Q. Why is traditional wood-to-wood log and timber joinery superior to metal-to-wood fasteners? A. Metal is harder and wears wood; Metal conducts moisture, rusts and rots wood; Wood attacks metal with tannic acids. Wood-to-wood connections last centuries beyond metal. Q. What makes ISBA different from other Institutions? A. . 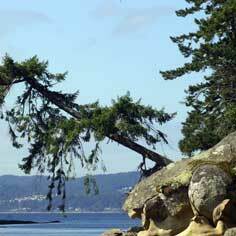 Spectacular island location in the heart of the forest - no industrial park or trailer portables. ISBA specializes in all three forms of big wood joinery: Log, Timber Frame Post and Beam, and Timber Frame Hammer Bents and all tools are supplied. Other schools teach only one discipline and often expect students to supply their own tools. ISBA teaches consistency in layout across all three courses in Log and Timber. Q. What is the difference between Square Rule face layout and Virtual Rule centerline layout? A. Square Rule layout references joinery layout from an exterior face(s) making it a useless method for log joinery. Timbers are just square(ish) logs…Leveling an exterior face presents a sloping surface to the incoming timber, making joinery more difficult. There is no possibility of mitred joinery so re-planing will loosen the joints and framework! Virtual Rule maps a perfect timber inside the irregular wood based on centerline planes of reference. The joinery face (not the exterior) is leveled, presenting a surface perpendicular to the incoming timber for easier joinery. Centerlines keep the joinery in alignment and produce intersecting waypoints for square ruler and/or template layout, making joinery layout simpler and more accurate. The variant fat’ surrounding the perfect timber is mitred at the joints to produce a stronger re-planable framework. Q. 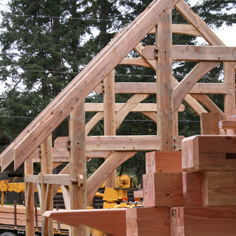 Why is your method of teaching Log Building and Timber Framing the best? A. In Log Building, We teach more skills in shorter time (weeks versus months) using a modular building approach. Short length logs ( 8') can build any size structure, making it doable for the average guy. In Timber Framing, We are the only School teaching virtual layout and mitred joinery, based on James Mitchell's book Master's Guide to Timber. Q. Why is ISBA campus the best place to learn Rock and Wood? 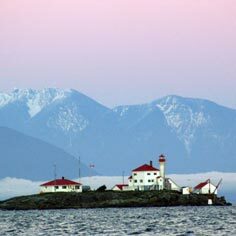 on a beautiful Isle of the Arts between Vancouver and the West Coast. Submersion...living in a big wood environment within a thriving artist community. Q. Can I gain employment or build my own Log/Timber house or Rock fireplace after taking your programs? A. Yes you can. ISBA Graduates receive a Skills Report and Certificate of Completion recognized by the Industry (see association logos), and the Confidence to build. Apprenticeships are in the beginning stage… ISBA courses/programs are skills recognized and applicable as time reduced. Q. Are log and timber frame structures engineer approvable? A. Yes, ISBA structures have all been structurally engineer approved. Q. I heard all fireplaces are heat inefficient? A. Rumford style fireplace, the type we teach to build here at ISBA are very efficient! The design has 45 degree sidewalls which kicks the heat outwards into the room. The throat of the chimney is narrow and rounded, creating a venturi-effect which draws the smoke.